‘King Bibi’: Perennial Survivor Netanyahu Comes Out Ahead – Coercion Code – "Dark Times are upon us"
Jerusalem (AFP) – Despite corruption allegations and stiff opposition from a new centre party, Israeli premier Benjamin Netanyahu has managed to boost his party’s share of the vote and looks set to keep power. While his right-wing Likud party and a centrist coalition appear set to have around the same number of parliamentary seats after Tuesday’s general elections, the man called ‘King Bibi’ by admirers has a clear path to forming a coalition. 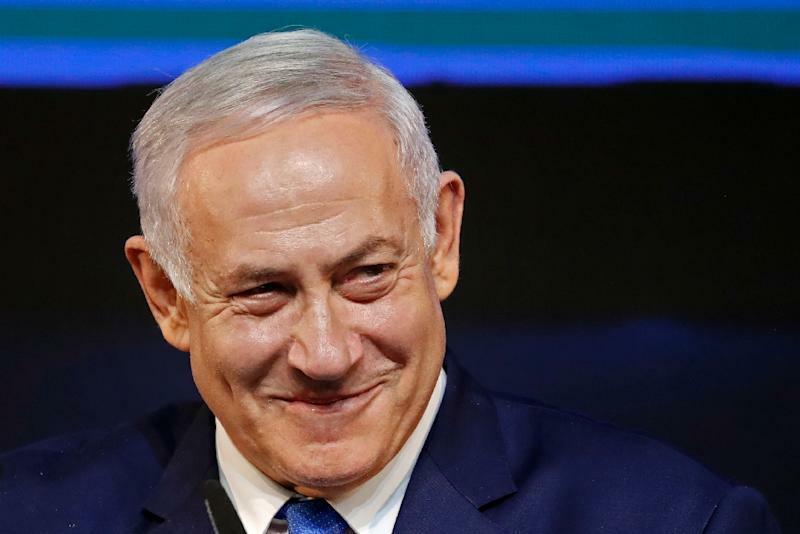 With more than 97 percent of votes counted, Netanyahu’s conservative Likud party looked likely to muster enough support to control 65 of the Knesset’s 120 seats and be named to head the next coalition government – a record fifth term as premier. The close and often vitriolic contest was widely seen in Israel as a referendum on Netanyahu’s character and record in the face of corruption allegations. He faces possible indictment in three graft cases, and has denied wrongdoing in all of them. Despite that, Netanyahu gained four seats compared to his outgoing coalition government, according to a spreadsheet published by the Central Elections Committee of parties that won enough votes to enter the next parliament. “It is a night of colossal victory,” the 69-year-old Netanyahu told cheering supporters in a late-night speech at Likud headquarters after Tuesday’s vote. The 69-year-old leader is now likely to form another right-wing government and become the longest-serving Israeli prime minister later this year. The elections appear to prove Netanyahu’s enduring domestic appeal despite the graft accusations, and a fifth term in office would have knock-on implications for the peace process with Palestinians and for his potential indictment. “It will be a right-wing government, but I will be prime minister for all,” he said. In Israel’s proportional political system, no party has ever won an outright majority. Instead the largest parties fight to form a coalition of at least 61 members of the 120-seat parliament. With ex-military chief Benny Gantz’s centrist Blue and White coalition leading in the polls, Netanyahu pulled out all the stops to shore up right-wing support. On March 11 he said Israel was “the national state, not of all its citizens, but only of the Jewish people,” sparking fierce criticism. Nearly 20 percent of Israeli citizens are Arabs. Then, two days before the election, in a seeming bid to steal votes from other right-wing parties, Netanyahu controversially pledged to annex settlements in the occupied West Bank. Critics say any such move would be a final nail in the coffin of the two-state solution, which envisions an independent Palestinian state alongside Israel. In the final days of the campaign Netanyahu was everywhere, giving interviews to all major Israeli media and constantly posting on social media. In the end his Likud party far out-performed expectations and is projected to have won around 35 seats, like Gantz. Ofer Zalzberg from the International Crisis Group think-tank said Netanyahu understood the right-wing had an inbuilt advantage in Israel and so could stick with his base. The right-wing bloc is predicted to have around 65 seats, compared with 55 for the centre and left, similar to the make up of the outgoing parliament. Even before the election, all the smaller right-wing parties had pledged to back Netanyahu for prime minister, meaning his victory was always likely, Zalzberg said. With US President Donald Trump’s administration providing unprecedented support, as well as diplomatic breakthroughs in Africa and improving relations with Gulf Arab states, Gold said Netanyahu had improved Israel’s standing in the world without having to give away much in exchange. Traditional proposals had predicated improved relations between Israel and Arab states and others on achieving peace with the Palestinians, but Netanyahu has not made that a priority. “The people of Israel saw this, that he was not a throwback to the past but had an orientation for the future. That set the stage for an extraordinary election victory,” Gold said. Two major issues face Netanyahu in the coming months. The first is the allegations of corruption including receiving thousands of dollars in undeclared gifts, as well as offering legal reforms in exchange for favourable media coverage. In February Israel’s attorney general recommended he be indicted on charges of bribery, fraud and breach of trust. Netanyahu has consistently rejected the allegations, labelling them a left-wing witch hunt. Analysts said the victory could strengthen his hand against the charges, with talk even of introducing a law that sitting leaders cannot be indicted until after their term ends. “He is still in survival mode and is likely to try to pass the immunity legislation or find a way to end the indictments against him for once and all,” Hugh Lovatt, Israel analyst at the European Council on Foreign Relations think-tank, said. Israeli policy in the occupied Palestinian territories will also remain a prominent issue. Trump is expected to finally present a long-delayed peace proposal in the coming months. Details of the plan remain closely guarded. Israel occupies the West Bank and east Jerusalem, while more than 600,000 Israeli settlers live there in communities considered illegal under international law. Netanyahu has long been sceptical of a two-state solution, saying Israel needs to control Palestinian territory for security reasons. “In this election he came out clearly and embraced his ideological opposition to Palestinian freedom,” Palestinian political analyst Diana Buttu said.